I like to be comfortable. Heat in the fall and winter is not only important for our comfort, but our survival. There is a a hitch, however, it can be expensive, unless you use your head. Heating with wood can save you a few bucks, but the price for cord wood, and wood pellets has risen significantly over the years. The trees ares still there, and they're still growing, but it's the labor that has risen in cost. Heating with wood has become pricey, and the labor at home required to maintain ones warmth with wood has stayed the same forever, it takes a lot. of those things I had in mind, so I developed a plan. In my first house it was heated by forced hot air, not the best heating system out there since it only heats the air in the room, and rapidly dissipates, but I made it work for me. Today, we have oil fed steam heat here in Fiskdale. The boiler is a little less than ten years old, and although not the most efficient model out there, it does quite well. We have two floors, but only one heating zone. This can be inconvenient, but it is something that can easily be dealt with. Steam heat is great. The room is heated well, and the hot iron radiators radiate the warmth long after the boiler has turned off. I'll share the simple ways I have always used to save money on heating my home. Before I get to the exact technique, one has to make sure their home has insulation in it. If you live in an older home with little, or no insulation, the technique will still work, but you won't save as much as you would if your home was insulated. Check out your windows. Are they drafty? Can you feel a draft around them? Do you have storm windows? First things first, caulk around your windows, make sure your storms are tight. When we moved into this old house in 2006 the windows were first generation replacement windows that were about 30 to 40 years old, and drafty as all get out. We put up that plastic sheeting for the first two heating seasons, and it worked very well before we replaced 19 windows with Harvey insulated windows in the beginning of the heating season in 2007. Within the first three months we saved 36% more on our heating costs! So, if you don't have the best windows, or insulation, what do you do? Well, work on those things, but in the meantime I will share with you the most effective way to save on your heating bill, and when you do begin to save think about how much more you will save if your house was buttoned up tight. First, spend $50.00, or so, for a setback thermostat. Get one that allows you to set at least 4 different heating periods through the day, and has the capability to set up a totally different schedule for the weekends. Once that is purchased and installed you are ready. I bought a model that has a little wheel on the side to allow me to increase, and lower the temperature on the fly. A lot easier than opening little doors, and playing with buttons. 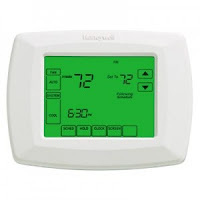 Set your early morning house temperature at a time that will insure those in your household will awaken to warmth. Figure out just how long it takes your furnace to heat the house up to a comfortable temperature, subtract that length of time from the earliest wake up time in your household. If it takes 30 minutes to heat up the house, and the first one wakes up at 6:00 AM, then set your thermostat to go on at 5:30 AM. Simple so far. Now, what time is everyone out of the house for the day? 8:30 AM? Well, then set the thermostat to a lower temperature at that time, and stay that way until 30 minutes before the first of the family returns for the day. This is all about good timing. Keep that temperature set till bedtime. Now, this is the crucial piece: SET THE TEMPERATURE LOW. Don't keep the temperature set at 72 degrees, or even 68 degrees. When folks are up and about in your home set the temperature at 66 degrees, and when the family shuts down for the day, and heads to bed, drop the set temperature to 60 degrees, or even a little lower. What?! 60 degrees? 66 degrees!!?? Yep. Now, here is how you will save, you play that thermostat like a fiddle. When you wake up the house is comfortable, and when it is empty, the furnace is set not to go on unless it becomes too cold, and you are saving money. When people come home, the house is warmed up, and folks are comfortable. Now, here is the most important part, when the temperature does drop down when the family is up and about, just turn up the thermostat three to four degrees. That's it, no more. The furnace will come on, and it will reheat the air, the walls, and take the chill out of the air in short order. If in a few hours, it becomes cooler again, then click it up again. How is this effective? Well, if you set the temperature for a constant temperature, even a low temperature, the furnace works harder to maintain it. On, off, on, off. Sucking oil, and more oil, or gas. However, if you play that thermostat to just knock the chill out the air a few times a day, you will save money in a big way. One thing to keep in mind is not to set the temperature so low that the furnace must work very hard to bring the temperature up to the comfort level. That would use too much energy to not only reheat the air, but the walls as well. Walls will retain warmth, and radiate it back into the room for a bit. They also retain the cold as well. Things to keep in mind. Set the temperatures on the thermostat to go way back at night, go up in the morning upon awakening, and way down when the house is empty during the day. If it gets a bit chilly when folks are home, turn up the thermostat 3 to 4 degrees, and that's it. No more. The heat will come on, and it will be very effective at removing the chill. When the temperature comes up, and everyone is comfortable, don't forget to turn down the thermostat again. Now, this may sound like something that is way too simple to actually be effective, but let me tell you, it works. It works very well. When my neighbors were spending $2400.00 a year in heating costs years ago, I was barely breaking $1000.00, and most often way less. Today, I get about 100 to 150 gallons of oil every four to six weeks from October through the end of March (depending on how cold it gets), one delivery in the late spring then nothing more till the fall, and we use the boiler to heat our hot water, too! Don't keep the thermostat set at a constant temperature, turn it down at night and when there is no one home, and play that thermostat like a fiddle when there are people home, and you will save a lot of money, not to mention not burn oil, or gas. Try it for month, if you don't notice a drop in you heating bill then close all your windows and try again. You will save. Can I save more? Yes. I am not sure of the exact amount of insulation in my walls, but it does seem that blown in cellulose insulation was used at some point. In the attic, there is old rock wool insulation under the floor boards, and replacing it is on the list. Eventually, upgrading the boiler would be great, but like most folks, if it ain't broke... . Currently, it is 41 degrees outside, not too cold, and the last time the heat went on was at 4:15 AM and was set for 66 degrees. It has not gone on again, and is currently 68 degrees here on the second floor. The iron radiators are continuing to radiate the warmth, hours after they were actively heating. It is now 10:00 AM. If you have forced hot air, or hot water base board heat this the technique I explained above will work just as well. Having iron radiators is just an added benefit, but hot water heat will do the same, to a lesser degree, too, and if you don't let your interior walls get too cold, it will work great with forced hot air. One more thing. If you know of someone in town that is having issues with staying warm during the heating season, then spring for a setback thermostat for them, and then sit down with them and see just how the technique will work for them. There is more than one way to get that warm and fuzzy feeling this winter.